The following products and services are at NO COST to eligible Homeowners thru this site! Experienced FREE* Legal Loan Modification from a Non Profit Law Center right now with just one click below. 100% Guaranteed Home Affordable Modification Program (H.A.M.P) Guideline Structure ready for immediate approval. Your 12 Year property value forecast compared against long term loan balance projections for future equity position assessment. H.AM.P algorithmic calibrations of floor rate, maximum term and required loan balance matched with your NET household disposable income. Immediate access to view your H.A.M.P loan modification loan structure before making any financial commitment with just one click below. Lender Fraud and Violation Analysis Report showing State and Federal Statute Violations just one click below.. Web Based Password Protected Paperless document upload, storage, update, recall and lenders action and response conversation log that is digitally date and time stamped for court room evidence if needed. Our proprietary Consumer Home Affordable Modification Program (C.H.A.M.P) is unique in its ability to allow its user to quickly compare the existing loan terms versus the proposed loan modification structure based on current posted Home Affordable Modification Program (HAMP) or Making Home Affordable (MHA) guidelines while comparing against the consumers personal financial profile taking the consumers NET household income into consideration versus a blanket percentage of GROSS. Consumer Home Affordable Modification Program (C.H.A.M.P) allows a "quick view" to the consumer of what happens to the H.A.M.P payment as well as forecasted equity potential well past the rate reduction term before the consumer accepts any loan modification, thus eliminating two of the above lender stated reasons the consumer maybe to blame for the failed program. Our unique H.A.M.P algorithmic analysis allows its user to view lowered rates down to the floor program interest rate, extend terms up to program limitations while identifying loan balance amounts that need to be addressed in order to achieve a combination of acceptable program guideline payments as well as payments that the homeowner can sustain, thus avoiding the 3 top reasons lenders state the homeowners are a cause for the failing Loan Modifications. 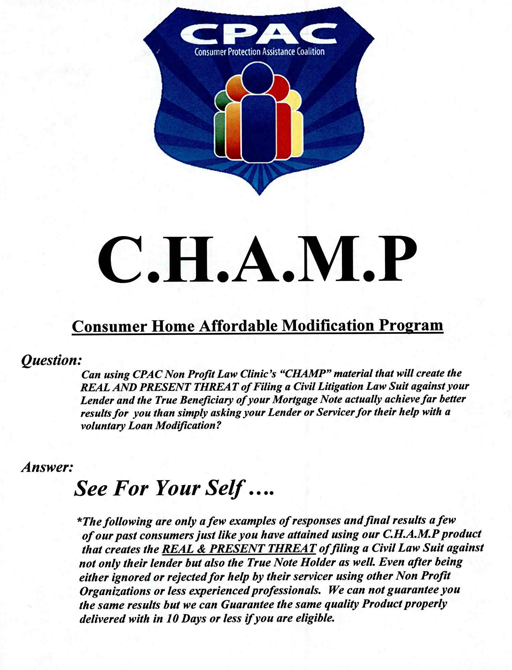 Consumer Home Affordable Modification Program (C.H.A.M.P) allows a "quick view" to the consumer of what happens to the H.A.M.P payment as well as forecasted equity potential well past the rate reduction term before the consumer accepts any loan modification, thus eliminating two of the above lender stated reasons the consumer maybe to blame for the failed program. Real and Present Threat of Lender Litigation Often times homeowners maybe dealing with only a Servicer of a loan and not the true note holder who may not be aware you wish to retain your home let alone sustain it with minor structure adjustments. The Servicers have agreements that may allow the Servicer to benefit financially from allowing you to fall further behind on your mortgage while allowing increased cost in Servicing fees and penalties to accumulate with little to no incentive to actually remedy your situation. CPAC combines its above mentioned CHAMP to forensically prove and documents your financial hardship and inability to maintain current loan structure while concurrently proving your ability to sustain your home under a reasonably restructured loan scenario showing NET PRESENT VALUE (NPV) test is met while compared and favored against alternatives including Short Sale and Foreclosure hence meeting SB1137 provisions. Lender Lawsuit Litigation can be used when you are still current on your home loan not experiencing any hardship and wish to have your lender offer you a voluntary loan modification that others who are defaulting are receiving that can be as low as a 2% interest rate, extended term up to 480 months and even a principal forbearance or reduction even though your lender may have rejected or ignored you in the past. This maybe accomplished by identifying potential illegalities that would warrant the unenforceability of the entire loan Contract altogether using the Court system. Homeowners have been successful using Lender Lawsuit Litigation to obtain favorable settlements from their lenders that they may have been previously rejected. Homeowners have also been successful in using Lender Lawsuit Litigation to force their lenders into reversing Trustee Sales or REO Reversals while getting a restructured loan they can sustain.CPAC products and services can be purchased at reduced prices that you can use in your real and present threat of suing your lender and majority of the material and cost can be applied towards the actual reduced cost of Litigation if less aggressive approaches do not achieve your desired result. Free Loan Modification will be provided to you with no commitment or obligation. A completely FREE Lender specific legal loan modification that includes the Home Affordable Modification Program documents as well as the Making Home Affordable Loan Modification Program documents, 4506 T , RMA, DOD act document, our Loss Mitigation Proposal request properly structured per CHAMP's findings and the HAMP Loan Modification 12 year simulator.